After Fethiye, we were interested in continuing to explore the Turquoise Coast of Turkey. We hopped on a bus heading to Antalya and asked to be dropped off at the turn off to the ruin/beach of Patara. We understand that during high season there are dolmuşes that run from the intersection in to the town of Gelemiş, as well as the ruins and beach at Patara. But, knowing that it was off season, we contacted our pension, the Eucalyptus Hotel, and organized for them to come pick us up at the intersection. We really enjoyed the Eucalyptus Hotel, though we were the only guests there. We had a comfortable, pretty large room. The hotel provided breakfast every morning as part of the price. They also cooked dinner to order. The town of Gelemiş would be quite a tourist town during the summer, but in November, it was completely dead. We really felt as if we were the only tourists in the entire town. So we spent most of our time just hanging out by ourselves. The couple that ran the Hotel was very kind and we did get a chance to chat with them a few times when they served us our meals. We did make good friends with the cat at the hostel. We think they called her “Kedi,” which means kitten in Turkish. She would always join us for meals and follow us back to our room when we headed up. The main reason for staying in Gelemiş is to visit Patara. Our first full day in town it seemed a little chilly and windy but we decided to head out anyway. 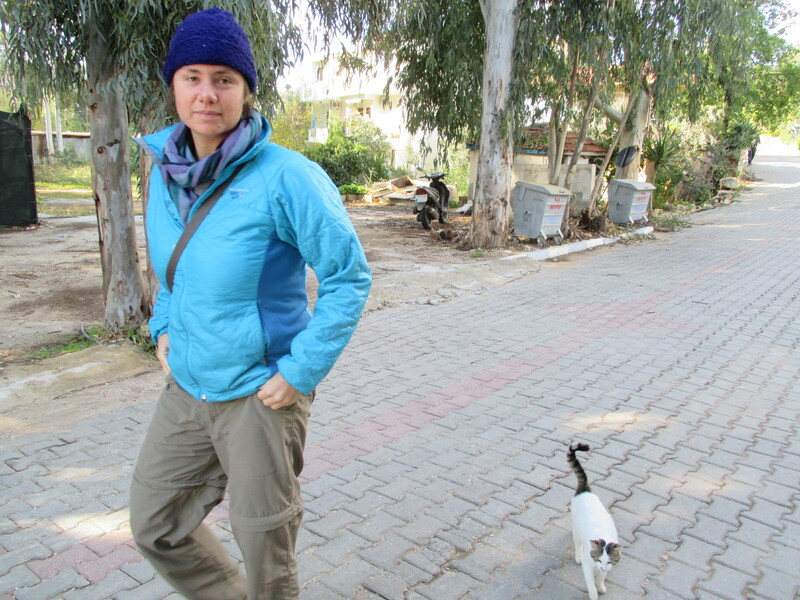 Kedi followed along with us. At first we thought it was cute but as we got further and further away we started to get more worried about her ability to find her way back to the Eucalyptus. The wind seemed to get worse as well. After walking for a kilometer, we looked at each other and made the decision that it just wasn’t the right decision to continue on. So we turned around, making sure Kedi followed us back. We spent the rest of the day sheltering from the wind in our room. The next day was still windy, although maybe a little less than the previous day. Given how dead the area was, we decided to just push through and visit Patara anyway. We snuck out to make sure that Kedi did not follow us this time! We explored the ruins of ancient Patara. It was said to be founded by Pataras, the son of Apollo. It was a thriving port town, though the ocean was now quite a distance from the ruins. The city was known in antiquity for its oracle, similar to the one at Delphi in Greece. During its heyday, it was the the leading city of the Lycian League. Apparently, it was also the birthplace of St. Nicholas (of Christmas fame). We explored the distinctive Lycian sarcophagus tombs, the still standing gate into the city, ruins of baths, theaters, the agora, and even a lighthouse. We also saw the Grove of Leto. Legend states that the god Apollo was born of Leto. Apparently when the pain of birth hit her, she threw her arms around a palm tree and then had Apollo. Some people believe that this palm grove was the very spot where that happened! As we mentioned earlier, it is low season in Turkey so we felt like we were almost the only tourists in the whole site. However, there were several animals running around. We were joined by goats, sheep, and three dogs. Della made the mistake of being friendly with the dogs, and one of them decided to adopt her. We spent the rest of the day in the company of this adorable dog. We felt terrible knowing that maybe he thought he was coming home with us. Long after his dog friends left him, he continued hanging out with us. We didn’t lose him until the end of the day when we headed back to our hotel. They enjoyed the ruins too! This was the dog we couldn’t get rid of! After the ruins, we continued on to probably the biggest pull of the area: the beach. We understand that in the summer, the beach would be packed. But, again, we were almost the only people there. We enjoyed hanging out and reading our books. It was a bit windy and far too cold to want to swim so we just hung out on the sand. As the afternoon wore on and the wind increased a bit, we headed back towards town with our dog friend trailing behind. We were both sad and relieved when he left us in town. We ended up staying in Patara for 3 nights. We really enjoyed our hotel and the ruins and beach, but again, we wish we had come when there was a bit more going on! Hard to get the season right it seems.